This method is particularly useful for portrait photography and to improve skin tones. However, I have used it on many other projects including interiors too. It is in fact one of the most used methods in my regular workflow. Use it where you can and see how it, very subtly, alters your images to breathe a little life into your shots. Sometimes, when photographing people the skin tones can appear a little flat, especially if you are using a digital camera. This page shows you a quick (once you know it) and effective way to bring back and improve the skin tones. 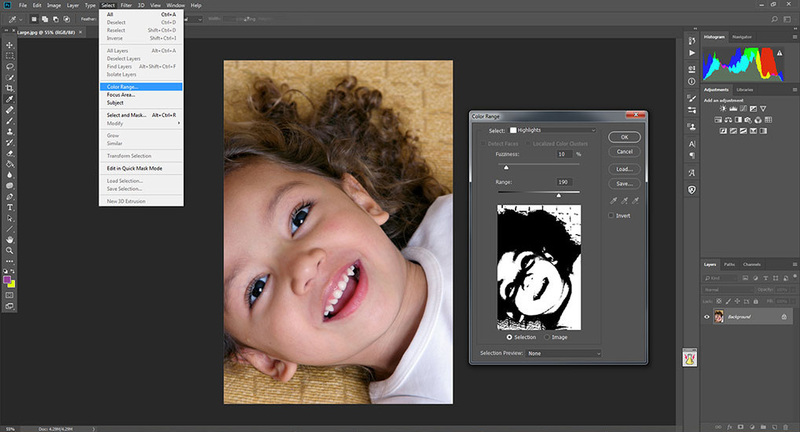 We will also add a subtle increase in highlights as though you were using the highlights tool in Photoshop. I have used a human subject for this tutorial. However, as I said earlier, try this on a few of your other subjects and see how it improves them. The reason you click "invert" is that when you click OK, it will otherwise select the highlights. We want to work on the opposite to raise the levels of the darker areas. If you forget to tick the box and have hit ok, you can simply right click on the image and select inverse from there. 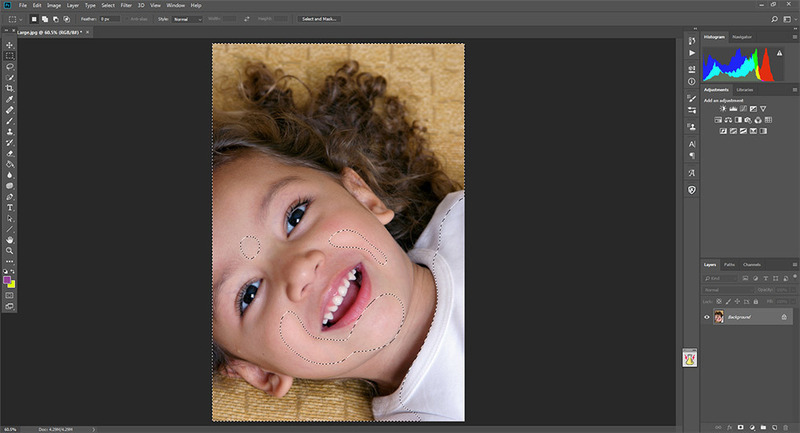 You may be thinking "why can I not just select shadows instead of highlights and save going through all this hassle?" Try it and see. The difference is quite noticeable and that way tends to blow out the highlights that are already there. Ok, next. You will see that the running ants are running around the selected area. But, if you were to start increasing levels now, you would end up with strongly defined lines around the altered areas. We need to "feather". Because we want to improve skin tones, they need to be blended well, so I've selected a radius of 30. This will blend any adjustments I make without leaving a trace. I normally use between 20 and 40 but it is something you will need to experiment with for yourself for each individual image. The larger the image dimensions, the larger the feathered area in general. Once you hit "OK", you will notice that the running ants have smoothed out significantly as in Fig.3. This means any work you do will blend nicely. What we need to do next is bring up the levels of the shaded areas, but not too much. This is to increase the brightness slightly. As you should see, the base of the light part of the histogram (mountain range) on the right will have a gap. This is where you have selected on the image and need to bring the slider back to the base. You may not need to go all the way. Watch the image as you work and stop when it "looks" right (see Fig.5 below). When you have found the perfect spot, click the preview button on and off to see your changes. You should notice a subtle but effective increase in skin tones and general appearance of the image. Because the alteration is so subtle in this example, hover your cursor over the image to see the before and after. If on a Smartphone, tap inside and outside the image. This is a fairly basic and straightforward way to brighten an image and improve skin tones in most people. Also, get used to this technique and try it on all of your images, not just portraits. It will usually brighten up dull images without blowing out the highlights.